With Studex, ear piercing is smooth and easy. You will barely notice when your ears are pierced. With our state-of-the-art instruments, this is a quick and clean process. 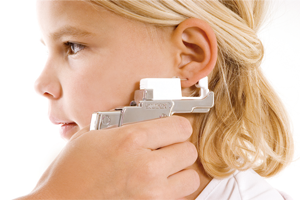 With our Studex System75 ear piercing system, your ear piercing specialist inserts single-use cartridges containing one piercing stud each into the instrument and does not touch the stud with her or his hands. These special, sterile piercing studs are the only thing touching your ear. While your ear is pierced with the piercing stud, the earring back is placed exactly where it is supposed to be, ensuring that the earring is closed properly behind the ear. By automatically positioning the earring back, we make sure that there is a little space between the earring back and the back of your earlobe as well as the earring head and the front of your earlobe, thus supporting the healing process. After piercing your ear with Studex System75, your ear piercing specialist takes the empty cartridge out of the instrument and disposes of it. Your ear won’t touch the instrument. With our patented Studex technology, we are proud to provide a completely safe and sterile piercing experience.